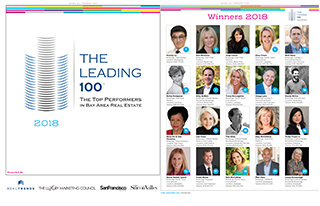 We wish to congratulate the 2018 Leading 100 honorees for their success, which is based upon hard work, passion for the business, and commitment to both their industry and their clients, on whose behalf they labor tirelessly. Theirs is an accolade much deserved, and it is with great pleasure that we communicate that achievement to the community at large—to industry peers and to the clients who rely so heavily upon their valued service. Download a copy of San Francisco magazine’s special Leading 100 List supplement from 2018.